You can never accuse Wolverine of bashing out material and flooding the market to satisfy contractual demands. Their last album ‘Communication Lost’ was a welcome addition to my fiftieth birthday list, and as ‘Machina Viva’ hits the shops I’m pushing fifty-five. But while this is a tad frustrating for fans, the time the band spend crafting their albums means that releases are never rushed but are nurtured and caressed into shape; consequently every album comes straight from the top drawer and, as a result, is pretty much flawless. And, OK, while ‘Machina Viva’ doesn’t stray from far from the band’s traditional path – being more of a companion piece to ‘Communication Lost’ rather than a follow-up – it’s an album of such beauty, such treasures, that it is arguably the best thing they’ve released in their twenty-one year history. 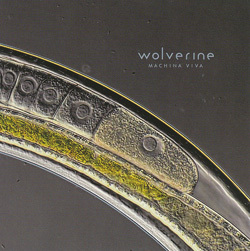 The Swede’s fifth full album (and their first for The Laser’s Edge), ‘Machina Viva’ is dominated by opener ‘The Bedlam Overture’ which occupies a fifth of the CD’s running time, unveiling its secrets over fourteen or so minutes, and which is pretty much a microcosm of all that is Wolverine. As such, the rest of the album follows in a similar vein; brooding, melancholic and deeply introspective, with songs that allow the individuals of the band – founders Stefan Zell (vocals) and Marcus Losbjer (drums), Jonas Jonsson (guitars), Thomas Jansson (bass) and Per Henriksson (keyboards) – the space to demonstrate their individual versatility without ever detracting from the majesty and opulence of the whole, as ably demonstrated in the likes of the staccato ‘Pledge’ or the almost ambient ‘Sheds’. As with a lot of Wolverine’s work, outlandish time signatures, virtuoso delivery and intense and insightful lyrics dominate the proceedings, but nothing is quite what it might seem, and it’s certainly not for ‘casual’ listeners – you only get the best out of a Wolverine album if you’re prepared to really engage with it. The digipack runs out with a ‘cello version’ of the sombre ‘Pile Of Ash’, and, as on ‘Communication Lost’, ex-Year Of the Goat and one-time Wolverine member Per Broddessen pops up to deliver a cracking guitar solo on ‘The Bedlam Overture’. What’s not to like?